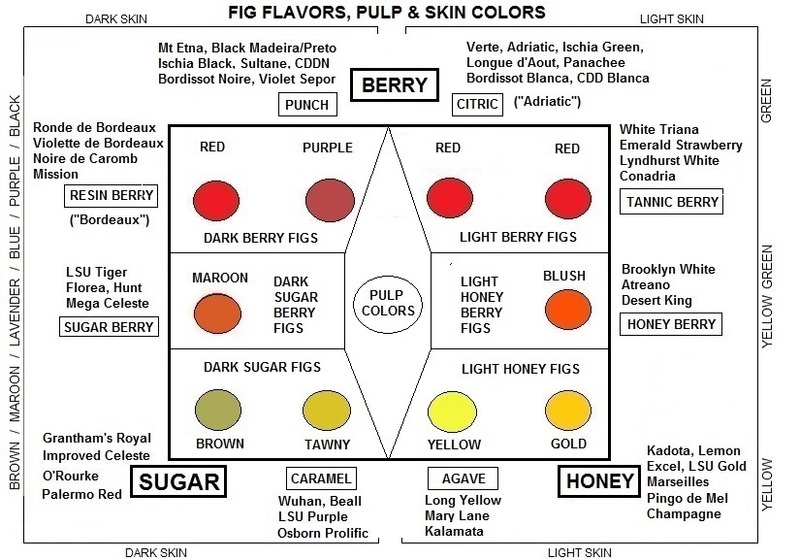 In this 10 mode flavor, skin & and pulp color model, the 2 dark skin berry figs are grouped together, the 2 light skin berry figs are grouped together, the 2 dark skin sugar figs are grouped together, the 2 light skin honey figs are grouped together. All of which at the corners reduces the modes to 4. 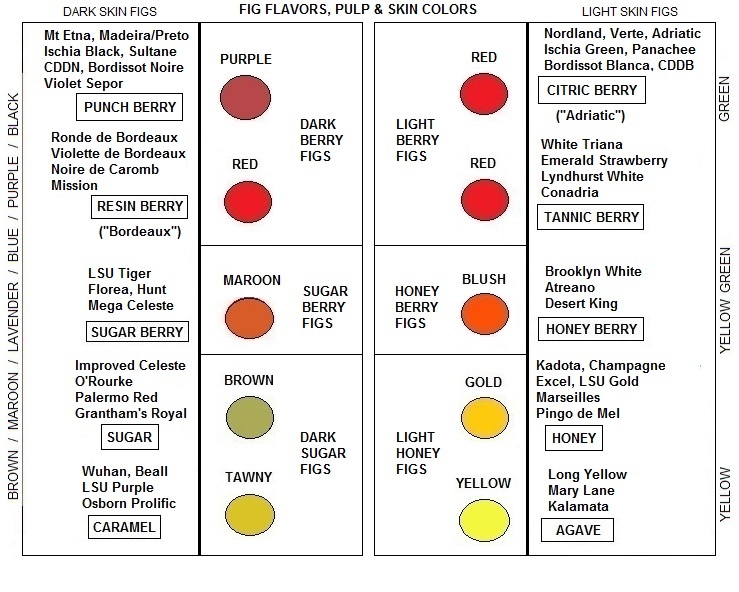 Between the dark skin modes are the in-between sugar-berry figs, and between the light skin modes are the in-between honey-berry figs. So that’s 6 modes: Dark berry, dark sugar, and dark sugar-berry; light berry, light honey, and light honey-berry. Ignoring skin color and considering honey simply to be a type of sugar makes for two types of figs total: berry figs and sugar figs, including mixed sugar berry figs. That simplifies things all the way down to flavor in isolation. Can be more interesting or practical to consider figs in flavor and skin combos, or further as flavor, skin, and pulp combos. And this can be done relatively simply, ranging from 3 or 4 modes of flavor/skin/pulp to 9 or 10 modes, give or take. This 10 mode fig flavor and color diagram loses the nice triangle shape of the 9 mode diagram but accommodates another mode and probably better shows the FPS spectrum. Sometimes if not perfectly ripened, certain green/red varieties may have a bitter (resinous or tannic) taste that seems to come from the skin, or just underneath it: Conadria, White Triana, Lyndhurst White, and Emerald Strawberry (143-36), for example. These figs may be a light skin counterpart to the dark skin “Adriatic” mode, tannin berry to resin berry. 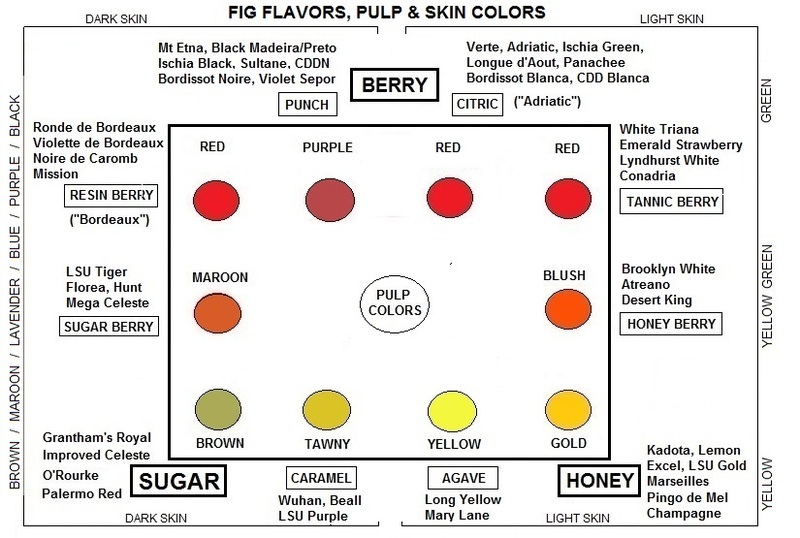 The skin tends to be greener and the pulp darker red than the honey berry mode of Brooklyn White, Atreano, Desert King, etc.